I think all teachers are always on the lookout for great deals they can get on school supplies during the summer. I know I always have- even before I was in a traditional classroom. This year, though, it’s gone to a whole ‘nother level. As I’ve mentioned before, I’ve already spent a bajillion dollars on stuff to outfit my room to try and make it match the vision in my head. And school supplies are now making their way to the top of my to-do list. You see, I’m going to be working at a Title 1 school with a very high poverty rate. While I’ll get school supplies, I can’t rely on getting things replenished, nor can I really design my supply list to match what I’d like. So, I’m going to be stocking up on my own. I started picking up a couple things last week when I noticed the penny and dollar deals. This week, I’m putting another list together. I thought it’d be fun if I shared the deals with you each week- and early enough that you can get them for yourself if you’d like. I’ll keep putting the dates on the button so you know that it’s the right week. Also, I’m only going to be listing the stores that are in my area since I don’t know how others work. Some might require rewards cards, and some might be a good deal with the store’s rewards program, but since I’m cheap a deal watcher, I already have those cards. -Early Learning Activities $1- According to the picture, it includes borders, stickers, bulletin board letters, and tons more that I wouldn’t put under that category. I plan on going this week and I’ll let you know what I find. -iMagine book covers $1- I think I’m going to use them as chair pockets on my small group table. You can see more here. -3M Command Hooks $1.50- I am going to go through a million of these and I generally find them for about $3. They also have some coupons in their ad and they have all of the same ones on their website as well. -Notebook paper-$0.25 for 150 sheets- You must spend $5 and have their rewards card. Limit 3. -1 inch binder- $0.92. That’s not the best price ever, but it’s pretty solid and much better compared to some others’ $4 price. **My CVS had bonus packs in the office supply section and not in the Sharpies display. I essentially got two 16 packs for less than $7. The pen price is not good at all, but that Sharpie price made me quite excited! -Wexford Mini Highlighters- $0.13 with in ad coupon. Limit 16. I went to 2 different stores and neither had these. They had a very small office section and haven’t put additional school supplies out. I was hoping to get a bunch for Writer’s Workshop but I wasn’t that lucky I guess. -Wexford Scissors- $0.49 for student scissors. Limit 6. I picked up 5 of these (that’s all my store had- again, sucky selection) but I was excited to at least get a start. -Wexford pencils- $0.10 for 8 pack. Limit 3. This is a Max Value item (which matters later). -Papermate pens- $0.10 for 10 pack. Limit 3. This is a Max Value item. -Officemax glue sticks- $0.25 for 4 pack. Limit 3. This is a Max Value item. -Schoolio 1″ & 1.5″ poly binder- $0.50. Limit 5. This is a Max Value item. Poly binders are flimsy plastic. -OfficeMax filler paper- $0.50. Limit 5. This is a Max Value item. -BIC Matic Grip mechanical pencils- $0.50. Limit 5. This is a Max Value item. -Schoolio one subject spiral notebook- $0.01!!!! Limit 5. Must spend $5 outside of the Max Value items listed above. -Sharpie 4 pack highlighters- $1. I feel like this is a good deal but can’t find anything to support that either way. What do you think? -Officemax multipurpose paper- $1 after MaxPerks rewards. -Staples glue- $0.25 Limit 2. -Slider pencil case- $0.25. Limit 2. -Zebra Z-Grip mechanical pencils 7pk- $1. I did a review of Zebra products a while back. They’re high quality- though they aren’t my favorite and I’m still looking for a deal on those. -2-Hole Manual Pencil Sharpeners- $0.25. Limit 3. -Office Depot Filler Paper- $0.25. Limit 3. Phew! I think that’s it for this week! No wonder I’m so tired from doing all this shopping already! Let me know if you’ve found better deals at one of these places or if you think anything isn’t such a good deal after all. I got the glue at Office Max today and asked what the teacher limit was and they said 20! So, I got 20 of those packs! I am in the same situation as you: I teach in a Title I school and I might get supplies in the beginning, but asking for replenishments doesn't usually happen. We go through a lot of glue in my classroom! I love that you're doing this! I will have to check back again! I am going to get those mini-highlighters at Walgreens (they are always a hit in my prize store!). Teacher limit? They'll let you get more? I've never heard of that! Do you have their teacher rewards card? I need to contact the company because I was given a regular one and need the teacher one. Did that make a difference? I went to our local Office Max and I was told there was no limit for teachers! I got 30 folders for 30 cents! It was with their MaxPerks Card. Yes, I was just commenting to tell you the same! My office Max extends the limit to 20 for teachers!! when you go to Office Max, speak to the manager and have your teacher ID with you. The manager will usually let you get 2x the printed limit! Just want to add that for those who want their own laminator they are on sale at WalMart for around $25. I have one and wonder how I ever lived without it. What a great idea! I also teach in a Title I school. A lot of my kids usually go to the school supply giveaways that local churches host and will bring in whatever they get there, but it's usually a mishmash. I always buy 100 glue sticks (150 would probably be better, but I do have a stash of liquid glue if we run out), 50 boxes of crayons, 10 Sharpies (for me! ), and at least one set of composition notebooks. 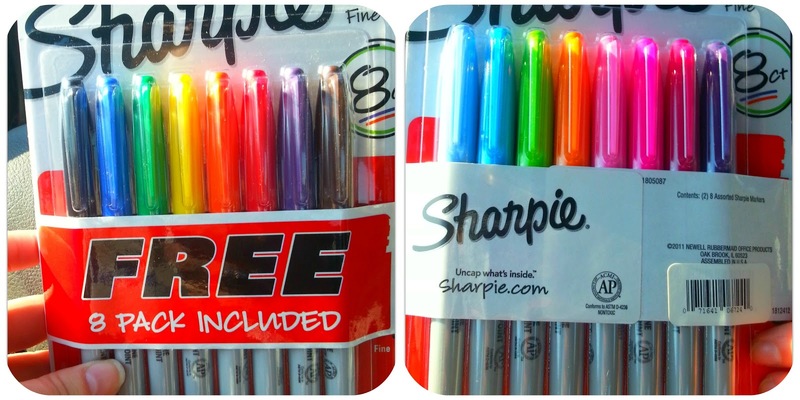 I have some CVS Extra Care bucks that I need to spend so I'm going to go check out those Sharpie packs! Thanks for the tip! Do you have Target where you live? They have a lot on sale right now. The one item that caught my eye (although my first graders might be too young for these) was the 70 page spiral notebooks for 17 cents each!!!! Wow! I, also, follow this blog, because I refuse to drive all over for the best deals. I'm ad matcher at Wal-Mart. Wal-Mart also has one subject notebooks on sale for .17 each. I just stocked up with 40 of them! I"m also at a Title 1 school so we don't get many supplies, and never anything replenished. Took advantage of that great price for sure! Thanks so much for posting about the deals you have found. If I recall, last year the office depot in my area had pocket folders with brads for only 1 cent, so I'm hoping they have that this year!